Saurian is an independent video game project focused upon creating the finest commercially available dinosaur simulation utilizing the Unity 3D game engine and drawing on peer reviewed research and consultation with leading experts to ensure our dinosaurs are as accurate as current knowledge allows. The game will being by focusing on recreating the Hell Creek ecosystem of 66 million years ago. We are currently hard at work on a playable prototype and are doing all within our power to have this out as soon as possible, so be sure to keep watching our pages for updates! I absolutely love the look of this raptor model. I love the colour design, and the shape of the neck and body. This is truly what a raptor should look like :). 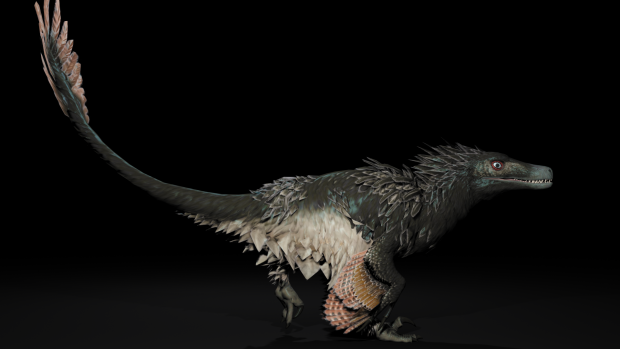 Official render of Saurian's Acheroraptor. Concept by RJ Palmer, model by Jake Baardse, animations, pose and renders by Bryan Phillips.